With the New Year just around the corner, we have dedicated 2018 to healthier living! In order to help us achieve healthier eating habits and an exercise routine we can stick to, we decided to invest in a few tools to help us on our journey. One of these 'must-have' tools is a reliable digital scale for the bathroom and we firmly believe it pays to invest in a quality one. Those of you who follow us often know that we put quite a bit of time into researching our purchases before buying them. After reading so many positive things about the EatSmart Precision Extra Wide Stainless Steel Digital Scale with 550 LB Capacity, we reached out to EatSmart to try it for ourselves. From the moment we opened the box and saw the sleek look and extra wide size of this scale, we felt confident we had made the right choice! The EatSmart Precision 550 Digital Bathroom Scale is more than your average bathroom scale. Its size, style, durability, and sensor options make it an exceptional choice. This scale requires 3 AAA batteries, which are included in the purchase. The wide size and light up LCD display are great for those who have vision difficulty as well! The size of the Precision 550 is one of its best selling points! It features an extra wide 15" x 13" tempered glass, black base to accommodate feet of all sizes and width. We especially love that the stainless steel is fingerprint resistant. The extra-large LCD display makes it easy to see your weight. We're really happy with the durability of the Precision 550. The scale itself weighs about 8 pounds and the low, wide surface makes it sturdy to stand on. The sensors accurately measure weight in 0.2 lb or 0.1 kg increments, depending on your preference. Simply switch your measurement unit by pushing the unit button to the left of the battery compartment. 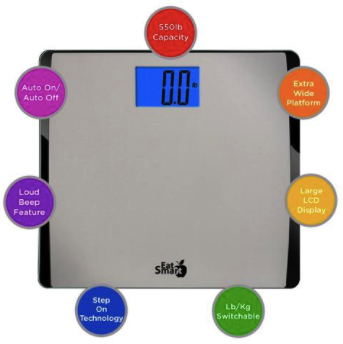 When you step on the scale, you'll hear three beeps which will lock in your weight so that you can step off the scale and easily view the blue extra-large LCD display. The "Step-On" Technology automatically turns on when you step on the scale and turns off again on its own to conserve battery power. Calibrating this scale is super easy and only needs to be done once (unless you are switching units of measurement). Place the scale flat on the floor and press the top of it with your foot. The scale will light up and read 0.0 when it is ready. Wait for the scale to shut off on its own. After that, you're all set! It's one of the fastest and most accurate scales we've ever owned. Beep feature - When weight locks in, scale will beep allowing user to step off and have an easy view of the readout. Auto Calibrated, 4 High Precision Sensors - Consistent and accurate measurements. EatSmart "Step-On" Technology - Get instant readings! The EatSmart Precision 550 scale can be purchased directly from their website as well as Amazon.com, delivered right to your door! Disclaimer: The product in this post was provided by EatSmart. As always, our posts are our own, honest opinions.